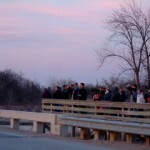 This bridge,1.5 miles south of I-80 exit 285 in Buffalo County, provides a parking area and viewing platform (Central Platte Natural Resource District, Richard Plautz Viewing Site) for watching crane roosting flights. The Central Platte Natural Resources District (CPNRD) has led a task force in providing a series of crane viewing decks for use by visitors. 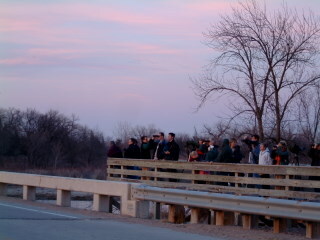 The decks provide a safe area to view cranes and other wildlife on the Platte River. 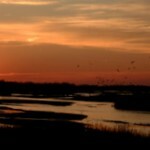 Best times for viewing are sunset and sunrise. 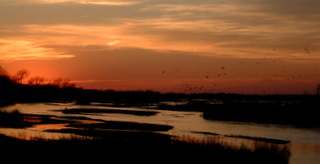 Cranes, herons, egrets, pelicans, waterfowl, song sparrows and a host of other birds can be seen comfortably from this wooden observation deck. Be careful to avoid standing on the bridge itself, where traffic can be quite fast.